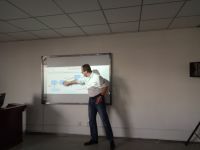 Markus made the slides available on his website: android energy consumption, wave energy. He is grateful for the support of China Science and Technology Exchange Center (CSTEC) [中国科学技术交流中心], the Australian Academy of Technology and Engineering (ATSE), and for the support of Profs. Bin Li (USTC), Xingyi Zhang (Anhui University), and Thomas Weise (IAO).